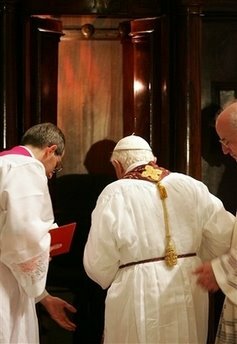 Pope Benedict prepares to hear confessions. The Sacrament of Reconciliation really gets us on the right track especially if we are in a state of serious sin. Saying we are sorry to God is saying that we love Him. We don't love Him just before Easter and Christmas; but we love Him all the time. That's why we wouldn't want to leave off Confession for a couple of times a year or worse yet a few times in our life time. Now, if we see the value of confessing our sins in the Sacrament of Reconciliation, we want to make good confessions as well as frequent ones. We don't want to be sloppy in our love for God. But why not just confess my sins privately? Why go to a priest? Jesus tells us to. When He instituted this Sacrament, He said to His Apostles "Whose sins you shall forgive, they are forgiven them; whose sins you shall retain, they are retained." (John 20:23) He was saying that they would have to hear sins; they would have to hear the confession of sins. And this power to absolve sins would be passed to their successors through Ordination. So, let's always try to love God more and more by making thorough and complete confessions. This means making use of the practice called the examination of conscience. Here, we really get down to business and show that we are serious - serious in our love for God. Our Lady will help us to do this. We commemorate her total compliance with God's will tomorrow, the Solemnity of the Annunciation. Usually it is celebrated on the 25th of March. But, today is a Sunday of Lent which takes precedence. Let's ask her to obtain from the Holy Spirit a better knowledge of ourselves -- of our weaknesses and sins -- so that they can be confessed and absolved.